Jahana Hayes campaigning outside the convention Monday. 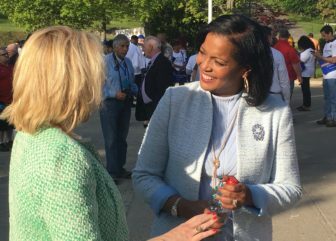 Two candidates who narrowly lost convention endorsements for Congress and state treasurer, Democrat Jahana Hayes and Republican Art Linares, said Thursday they will seek their parties’ nominations in primaries in August. Hayes, a former national teacher of the year who was encouraged to run for the open seat in the 5th Congressional District by U.S. Sen. Chris Murphy, said she was heartened by her close finish Monday behind the winner, former First Selectman Mary Glassman. Hayes appeared to win the endorsement on the second ballot, but New Britain changed its votes three times before the voting was closed, giving Glassman the endorsement. Treasurer candidate Art Linares asks delegates if they would switch their vote to support him at last weekend’s Republican convention. At the GOP convention on Saturday, delegates endorsed Thad Gray for state treasurer over Art Linares in another close race. Gray led after all delegations voted, while Linares briefly pulled into the lead on vote switches, before Gray ultimately won. A convention vote of at least 15 percent qualifies a challenger for a primary. 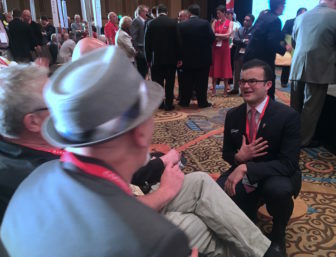 Linares said he took several days after the convention calling supporters to see if they still would back him in a primary and was encouraged by the response.